CFS West Installations has over 25 years of experience in the installation of flooring systems. We offer superior warranties for our clients upon inspection of floors. CFS West Installations personnel attend at our headquarters for on site training seminars dealing with all aspects of preparation, application, repair and most importantly safety procedures. We monitor all installations. In this manner the customer is assured of only the highest quality of workmanship. Any application is only as good as the surface preparation completed. We take the attention and time required to meticulously prepare surface areas correctly the first time. All safety standards and suggestions are strictly implemented during installation of your flooring system. Our qualified installers abide by all WSIB regulations regarding the use and mixing of chemicals. Solvent resistant gloves, eye protection and respirators are used during installation. All equipment used during the installation of your flooring system is CSA approved. The required equipment is provided and transported by CFS West Installations to ensure a worry-free and hassle-free installation. Sales and technical staff are available to assist in job-site evaluations, equipment recommendations, specification writing, contractor training, job follow-ups and warranty issuance. 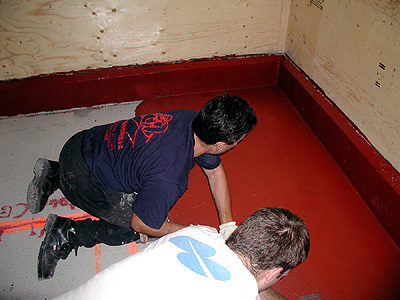 Contact CFS West Installations at Service@Covercrete.com or 604-805-5161 for information or assistance required.